One of the surest ways to compromise a crime scene is to walk all over it in dirty footwear. 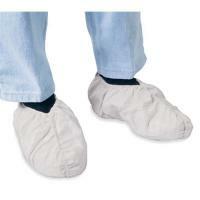 The Disposable Shoe Covers from Sirchie offer a convenient and easy way to preserve the integrity of a scene. Alternatively, the covers serve for ready use in a forensic laboratory. The one size fits all design pulls on over ordinary footwear, preventing contamination and keeping shoes protected from any debris or fluids in the environment. They are made from durable TYVEK®, a high-density polyethylene non-woven material. Sirchie's impressive TYVEK® blend is lightweight, resists tears and punctures and offers resistance against many chemicals as well as fire.